Why Are All The Stories Old? I missed an issue, can you resend it? Can I Link to a HeroicStories Story? May I re-publish this HeroicStories story? Why did I stop getting HeroicStories? Growing up, we didn’t have much. Actually, we had very little. With three little mouths to feed, my daddy worked as a janitor and then farmed our own small field until dark. Daddy provided for us the best he could, and mama made our clothes on her old sewing machine. It was probably evident to all the teachers and kids at school just how poor we were. Then came third grade, Mrs. Harper’s class. Mrs. Harper brought a huge box of toys to school to give to “needy” children. Everyone was invited to bring some of their own toys from home to put in the box. Needless to say, I had hardly any toys of my own. By oh boy, did my eyes get *big* when I looked into that box. It was like a dream world to me — so many toys! Evidently Mrs. Harper saw the look in my eyes, and although I never asked, she offered to let me pick out two toys for myself from the box. I was so thankful and thought I was the luckiest girl in the whole world! When I got home I couldn’t wait to show mama. She admired the toys and asked where I got them. I told her about the box for the needy children and that Mrs. Harper had let me pick two from the box! Mama thought for a few seconds and in a very sweet way, said “No… no, you can’t keep them honey. You see, there are little children in the world that don’t have anything.” She explained to me that those toys were for “poor” children, and I had to return them to the box because it wouldn’t be right to keep them. She wasn’t angry or resentful that the teacher had let me pick them, she just stated it as a matter of fact. Although I was disappointed I couldn’t keep the toys, I was somewhat proud to take them back. After all, they were for the poor little children in the world. So the next day, I took them back to the big box and explained to Mrs. Harper why I couldn’t keep them. With a smile, she said she understood. 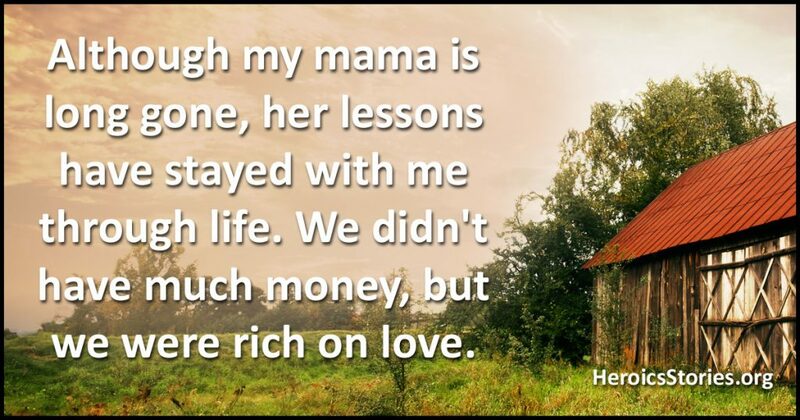 Despite the obvious fact of how poor we were, my mama made me believe differently. She made me see myself differently and made me proud of who I was. From that point on, I always felt sorry for the poor, but never considered myself that way. Looking back now, I can see just how poor we really were. We had holes in the floor, leaks in the roof, a freezing house, worn out shoes, few clothes, and little food. We could have easily applied for welfare, but my daddy wouldn’t think of it. Our family was full of integrity and proud of hard work. Although my mama is long gone, her lessons have stayed with me through life. We didn’t have much money, but we were rich on love. Note: HeroicStories aims to be a place of positive energy in what sometimes feels like an increasingly negative world. Our goal is to highlight good things done by good people that make the world a better place. To that end your comments are not only welcome but encouraged. However, comments that simply find fault or otherwise complain about some aspect of a story will not be published. There's simply no need to find fault here - there are plenty of places on the internet for those discussions if you really feel the need to go negative. Instead, look for the good. It really is everywhere. “Who is rich? One who is satisfied with his lot.” This is from “Ethics of the Fathers” written two thousand years ago by Jewish scholars as part of a work known as “Mishnah.” This, to me, is exactly the point the author is making. Still fresh after two millennia. I agree. I have quoted this from Ethics of the Fathers when I have been talking to people. © Copyright 2019 HeroicStories · All Rights Reserved - No part of this website may be republished without written consent of the publisher. HeroicStories is a publication of, and webhosting and mailing services are provided by, Puget Sound Software, LLC and Ask Leo!